The Laois Association has been honored by the Parade Committee and is the first County to march up Fifth Avenue this year. We will also be on TV. between No. 20 and 6th Ave.
Let’s join in extending Laura Dunphy a big congratulations on becoming this year’s Laois Grand Marshal. This will be Laura’s 30th time to march up 5th Avenue. After graduating from Georgetown University, she worked as a journalist in Washington, D.C., Florida, and Los Angeles - but always returned to New York for the Parade. Now a Manhattanite, writer, and stay-at-home-mom, Laura is delighted to be leading her ancestral county. Husband Michael Erlinger and almost-three-year-old daughter Sophie are enthusiastic annual marchers as well. At the beginning of the march, Lesley Traver, last year’s Grand Marshal, will present Laura with the Grand Marshal sash for the current year. DRESS CODE: The Parade Chairman, John Dunleavy, is insistent that all marchers strictly observe the appropriate dress code, i.e. “Sunday Best” … sorry, no sneakers, no jeans. Please visit our website at www.nylaoisassociation.com for updates and previous years photo galleries. Hope to see you all once again on Wednesday, March 17th, St. Patrick’s Day. Mike Dunphy, cell 973-886-6097, (H) 732-292-0277, e-mail: mike.dunphy@att.net. P.S. See reverse side for Laois News. Sincere condolences to Kathleen Lambe (Clonaslee) on the loss of her beloved Jimmy Aspell (March 20th, 2009), a cheerful and engaging soul, who honored Laois by marching with us every year. We will miss his presence, but he will not be forgotten. Welcome to our newest members including Richard Dormer, Police Commissioner for Suffolk County, Tom Whelan of Garden City and Michael J. Whelan of Grand Rapids, MI. We are delighted to hear that Bill McEvoy, now 87 years, will join us again this year in the parade. Bill is a founding member and leading spirit in the very successful Ceoltas Ceoiltori na hEireann traditional musician tours of the USA and Canada. He was also instrumental in organizing the Killeshin Pipe band’s visit to the St. Patrick’s Day parade in New York. It gives us great pleasure to wish Stephen Colbert a hearty congratulations on his mother’s distinguished Laois lineage that goes way back to a young couple emigrating from our County before the “Gorta Mor” in the 1820s. To Stephen’s surprise, the connection was revealed on the recent PBS premiere of “Faces of America” hosted by Professor Henry Louis Gates. 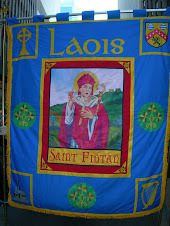 We are extending an invitation to Stephen to become a member of our Laois Association and to join us in the parade!!! (Link, http://video.pbs.org/video/1409077251/). Congratulations also to Laois member and author, Tom Phelan, on his forthcoming book and his new writer’s residency in Cill Rialaig, Co Kerry this fall. Five of Tom’s family, including his wife Pat and sister Matt from Ireland, will be marching with us this year. The County Laois Association has been moved up early in the line of march for this year's ST. PATRICK’S DAY PARADE, Wednesday, March 17, 2010. New assembly place and time: 11:10am 44 West 44th Street, marching after the New York Air Guard and ahead of County Wicklow, St. Patrick's Day, Wednesday Marth 17th 2010. We will be sending Press release out in early March. Please don’t forget to let your friends and relatives know of this change of time and venue so as to help swell our ranks. Please continue to visit our website at www.nylaoisassociation.com for further updates. Larry McEvoy, Vice-President, Cell (917)833-3218 email: LarryMcEvoy@aol.comOr, Mike Dunphy, President, phone (732) 292-0277, e-mail: mike.fran.dunphy@att.net.